This site is focused on information, information sources and discoveries made over the years trying to promote the study of medical geography. Medical history is my strength (other than a few science- and public health-related specialities readers will pick up on), so most of what I write are essays on discoveries made during the past 30 years researching the history of medicine, in particular New York and Hudson Valley medicine, but also Pacific Northwest medicine. This information I developed as a part of my work as a specialist in plant chemistry, chemotaxonomy and natural products at Portland State University for nearly 20 years. The chemical evolution chart I review on some of my pages was developed between 1987 and 1990. This next series of biographies of local doctors reviewed includes a number of “doctors”, “physicians” or “healers” who have not been not covered by past writers of Hudson River Valley history. One of these topics actually began the last time I posted on this page, soon after I initiated the biographies of Elisha Perkins of Connecticut, his followers along the Harlem River Valley and later those who promoted his healing faith along the Hudson River Valley in western Dutchess County. Until now, this view of Hudson Valley American Medical history has pretty much been tainted by past writers. Stories like these have been interpreted as examples of how unlicensed, poorly trained practitioners out there are laying claims to their unique philosophies and ways of treating. The fairly generic and culturally biased term attached to these kinds of practices is “quackery.” But these practices are no more incorrect than the regular practice of medicine was during this period in Hudson valley history. 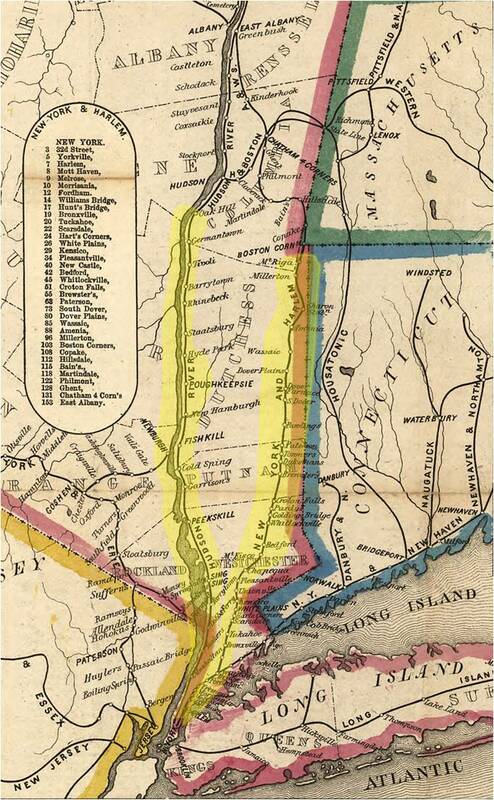 Hudson and Harlem Valleys and Railroad Lines into Dutchess County, 1858. Perkins’ philosophy came to be prior to the development of any railroad or steamboat lines, back when all of the local roads led to New York City, Newburgh, Poughkeepsie, Troy and Albany. The 1795-1810 Medical Electricity pop culture movement travelled from Connecticut to New York in a westerly direction, making its way to Troy and Poughkeepsie, but never developing much support in and around New York City. This was due to the number of licensed and formally educated physicians practicing in this regional commercial center. Between 1800 and 1850, medical philosophies were first spread by sailing ships and stage coaches, and later by streamboats and finally trains. Most of the professions during this time were spread by way of these two earlier commercial routes. This meant that the two mountain ranges–Taconics and Berkshires–formed important cultural barriers. The tale of Elisha Perkins and why he became so popular are reflections of the highly multicultural setting the Valley developed due to its Dutch heritage. The philosophy helped set the stage for alternative philosophies like those practiced by Dr. Osborn (Bordenism, a 1760s vital force theory, covered elsewhere), Jewish Physician Isaac Marks, early Dutch promoters of Christian alchemical thinking (1649, Harvard student George Starkey, not yet covered), and the various Huguenot healers in the Valley who were natural philosophers and faith healers, and the unique believers in Christian Astrology and mysticism (one of whom in 1720 was called a “witch” according to Court records, partially covered). These faiths were followed by the practices of local Quaker physician Shadrach Ricketson, his associate in the Friends Meeting House Jedediah Tallman, and Medical Electrician Caleb Child. These events produce the history that set the stage for what would happen to the newest healers to come to the Valley for the remaining first half of the 19th century. The general impressions we are given for the past 3 or 4 decades is that there is this schism related to “medicine” versus “quackery”–the true or licensed, regular doctors, versus those who were more interested in nature, the body, mind and soul of medicine, and the healing processes accompanying these belief systems. For this reason, we traditionally called regular doctors “licensed” and the other healers “quacks” in the worst of cases, be they licensed or not. This is a social and culturally defined prejudice or biasness that even today many medical history writers express too freely and without any concerns for validity or personal opinions and subjectivity. It is better to review past doctors for who and what they are–regular MDs who were just as right and correct as their professional adversaries. At times their adversaries were even better “healers” than regular MDs, due to the human contact incorporated into their profession (much the same being true today as well). “Mrs. Smith“, ca. 1805-1820, a female practitioner for women, as well as men, apparently someone who is very religious and used this claim in her advertisements in the Poughkeepsie Journal to promote her healing skills; she was perhaps devoted to prayer and the laying on of hands, but also possibly highly skills herbology, like many older women, midwifery, and the most obvious, the skill of listening to your patient and employing common sense when it came to judging another individual’s lifestyle. 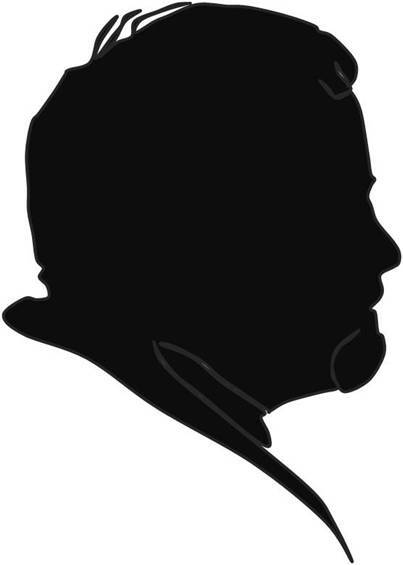 Physiognomotracers, 1800-1825–Hudson Valley individuals who considered themselves artists, philosophers and perhaps even the first psychologists, individuals who could read your mind, define your psyche, and determine your health physiognomonically by tracing your form on a piece of paper. Oregon Trail physician John Kennedy Bristow (1814-1887). More of the 1993 work that I based my classes upon was also made accessible. Bristow is one of the first non-allopathic doctors to take the overland journey, about whom much can be learned and told about alternative medicine as it was practiced along the trail. Like many early non-allopathic, post-early Thomsonianism physicians, Bristow criticized, botanized and philosophized. His practice in Illinois, along the Oregon Trail and in Oregon represents how much development, migration and change occured in medicine of all forms, throughout the entire 19th century. His life story provides us with important insights into the history and application of numerous alternative healing faiths then popular. such as that of the Thomsonianism sanative philosophy practiced by his mentor Dr. and later Rev. Edmund G. Browning (also a trailblazer) in Illinois, Indian Medicine doctor William Dain (covered elsewhere) from Fort Vancouver, Washington, Dr. Wooster Beach of New York and later Ohio, the highly popular domestic medicine book author Dr. Samuel Chase of the Great Plains states, Rev. Dr. Wm. Churchill of Brooklyn, and various local followers of the popular cultural movements related to anti-opium user, trapper medicine, local Pacific Northwest herbalism, gymnastics therapy, physiomedicine–the sequel to botanic medicine started by Alva Curtis, and the practice of this healing faith as it was detailed in the first Oregon medical journal Physiomedical Recorder. John practiced nearly all of the alternative faiths during his lifetime, excluding homeopathy. He believed in these philosophies due to his religious and cultural upbringing, and as a result of his own medical experiences (Rheumatic fever and related diseases), the deaths of two of his wives (Emmeline nee Hatch, Illinois, Ship Fever, 1847; Josephine nee Massie, Oregon Trail, Cholera, early April 1852) and his youngest daughter less than two years of age (Suzannah, along the Oregon Trail, due to either milk sickness or infant diarrhea/cholera, late April 1852, western Nebraska). In addition, I added several unique takes on the earliest popularity of the physiognomotracers (aka physiognosotracers), reviewing why they were so popular locally, how the military made use of this school of thought, and why it allowed Dr. Gall’s interpretation of the same to lead to the development of phrenology, a belief promoted most by the Fowlers of New York City and Wappingers Falls and which became one of the most important alternative medical philosophies in Hudson Valley history prior to the Civil War. A little more confirmation of the links that I propose exist between Cadwallader Colden’s metaphysical philosophy and the development of homeopathy are provided. Hahnemann’s work is a variation of some of the explanations Colden provided for how and why inoculation worked. The general philosophy for the time during the post-Colden era is reviewed as a connector for the philosophies preached by French Luminate and believed in by such European physicians outside the French communities like Hufeland and Hahnemann, between 1796 and 1810. This page is mostly a biography of Christoph Wilhelm Hufeland and his popularization of once fairly common natural healing traditions still practiced today –“Heilkraft der Natur” or vis medicatrix naturae. Both Hufeland and Hahnemann played very important roles in the recreation of the popular vital force theory believed in since antiquity, but made popular in America as a medical philosophy by physicians like Dr. Osborn sometime around 1760 by Theophilis Borden (1722-1776). The influence of the military on these healing trends are demonstrated by the development of early gymnastics (exercise) therapy and specific eating practices (the early diet therapies) (see Anton de Haan, Dutch medical philosopher, popular from 1740 on, but also see more details on the same by the inventor of “Sports Medicine” in the United States according to many–Shadrach Ricketson). I have also reviewed the unique story of a gifted girl, Rachel Baker, who came to Poughkeepsie ca. 1815. She had a disease that we would today consider “culturally bound”, but only during her lifetime. To have a culturally bound syndrome means that those of your culture believe this is the condition you have and so you manifest it. Even the physicians believed in Rachel Baker’s problems, and were an important part of the culture defining the possible existence of such a medical condition. The philosophy and interpretation of psychological, psychiatric and psychosomatic states today might classify this disease differently, perhaps as some form of epilepsy and/or hyperreligiosity. The contemporary interpretation of the scientific findings for the time (1812-1820 medical philosophy) defined this type of disease she had based on the contemporary professional interpretation of such events as suspended animation, somnambulism, and “mania”. Rachel’s case of “divine somnambulism” is an example of how so often we based our supposed scientific diagnosis on contemporary scientific philosophy, not necessarily scientific proof. More importantly this diagnosis is based on a review of one of the most important New York and Hudson Valley physicians for this time, Dr. Samuel Mitchell, a natural philosopher and a believer in evolution and phlogiston–that undiscovered element of nature that may be responsible for disease, an editor of Medical Repository. Mitchell was so highly favored and respected as a physician due to his position as a New York State representative, and his influences internationally as one of the key political forces for his time, someone we rarely ever hear about. Quite recently, writer Judith Curry posted an article citing my coverage on “Global Warming – Part 1“, posted in winter 2010/2011 along with a more detailed essay on “Deforestation and Global Cooling . . . ” and how this resulted in Noah Webster’s claims for local cooling which in turn led to the development of the local merino sheep industry in the Hudson Valley. Ms. Curry provides us with a very nice synopsis on this important piece of American history, which she posted in turn as a response to a Smithsonian brief on this topic published separately in just a couple of weeks ago in mid July 2011. Since the most recent author failed to mention the sources for this work, just to set the record straight, it should be noted that this notion of climate change and global warming defined as early as 1790/1800 was previously published in 2009. As usual, my hexagonal grid analysis methodology and related excel worksheet download, and my various historical maps, are my most frequented sets of pages. The most common topics perused by visitors of this site remain those which were previously noted, with the addition of GIS related Risk Management pages, which have doubled in attendence in recent days and weeks. As an aside, for those into GIS, as part of my population health risk management work, there is this method I created (and posted, except for the formulas) for performing exceptionally large population analyses by applying a raster GIS/RS moving windows formula. One can analyze two very different population sizes, previously considered unmatchable due to variance and standard deviations, to determine where statistically significant differences exist. Once I integrate this into other GIS applications, the overall GIS risk management and population age-gender health analysis processes will be improved. I am the recently conscripted editor of the Dutchess County Historical Society’s yearbook. It looks as though you could, if you would, have a great deal to contribute to my publication, Alas, all that I can offer, apart from publication, is an all-too-modest honorarium of $250 for a 3000+ word article. But if that proposition interests you, let me know, and we can discuss possible topics. PS. If you will send me a postal address, I shall send you a copy of my first issue. Sorry this is months late; I rarely check these interactions due to the gross amount of spam I am getting. It is hard to say what the most important story might be for this region. –I am inclined to think about Mannessah, but realize that is more speculative and narrative than purely based on historical documents. –A new take on the Fowler’s house would eliminate the tone of the older article on it noting it as Fowler’s Folly. The Fowlers are the most important family perhaps in alternative/non-allopathic medical history and the Hudson valley is where many of these changes occurred. –The Electric Cure has always been misrepresented as quackery, and although it is out of the realms of traditional allopathy acceptance by those in charge in NY/Hudson Valley, parts of it are no different from the stuff they were doing as well like bleeding and going for more toxic remedies between 1797 and 1815. The philosophy behind the “metalic tractors” is what is so important here–the elan vital or vital force concept, peaking ca. 1806. –Medical Electrician and Coffee enthusiast and promoter Caleb Child would also produce an important tale–he gets his degree in 1798, right after the 1797 law for licensure was passed, with limited practical and clinical experience, receiving it only due to his ivy league graduation and medical/natural philosophy schooling. — Cornelius Osborn’s 1755-1770 practice of the use of Bermudan Starkey’s ens veneris, being derived from his 1649 Christian Alchemy work at Harvard, was knowledge passed on through the generations for Osborn to obtain it; it was never published I believe, and has the same sort of history told about a Connecticut religious leaders’ notes on the same, with a philosophical concept that matches exactly no less; I believe this is a new part of the history of our region’s philosophy that has never before been published. This is a fascinating series of articles with such a profound depth of research, much of it related to a personal interest I share in the Mahican presence in Shekomeco and other places nearby and the history and influence of the Moravian missionaies here and was excited to learn as I delved further into the little known visit of Zinzendorf himself so nearby. I have visited most of these sites independently before discovering these articles. I visited the Mahican site on in Jackson Corners this Sunday, and on Monday recognized it in one of your pages which I later came upon in your work. And I would like to learn more. Does anyone know what ever happened to Massasseh after he moved to Ohio territory in 1860? Is there more to learn about Chief Crow and his people? – It is evident the Mahicans at Shekomeco had to pass by the town of Pine Plains on their exodus route. I have also seen what may be traces of the Mahicans in other historical documents. Let me know if you want to meet sometime.